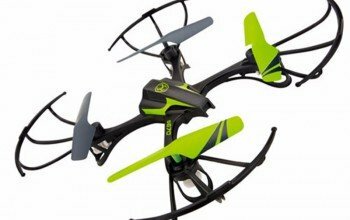 The Syma X8C is a great entry level, full size, outdoor quadcopter for beginners to learn or for experienced pilots to practice new maneuvers that they might not want to attempt with a more expensive quad. The X8C currently comes in several variations – the original X8C Venture, which features a 2 megapixel wide-angel camera – the X8G, which comes with a 5 megapixel GoPro style camera, and the X8W, which has the same 2 megapixel camera as the X8C, but streams a live video feed to your mobile device using Wifi. All 3 are about the same size and form factor as the DJI Phantom line, and they all range in price from $90 – $150 depending on which model and who you buy from. They also come in a variety of cool colors including a bright orange that is very easy to see in the sky and definitely stands out from the crowd. As I mentioned, the Syma X8C and X8W both come with a 2 megapixel camera. After testing the camera’s footage, I found it to be acceptable (although not great) for still images, but useless for video. The cheap lens and small sensor mean that even though the video is technically “HD”, it is not pretty. I did find that on calm days with no wind, I could get some OK video footage, but only if I flew very slow. If there is even a slight breeze, then forget about capturing any useful footage with this camera and no gimbal. However, as a FPV camera, the configuration on the X8W is not too bad. When you get a good signal to your mobile device using the Syma App, which is available for iOS and Android devices, you can fly this bird FPV, although there is about a 1 second delay. I have found that flying in highly populated areas leads to a lot of interference on the wifi signal, but if you take it out to a park or into the country, you can get a good range on the wifi signal. The Syma X8G features a removable 5 megapixel GoPro style camera that offers much better image quality for recordings and still images. Also, all 3 models offer a “headless” mode that makes flying much easier for beginners. As you may have guessed, the Syma X8C is the big brother to the X5C and has many of the same flight characteristics. Both feature a high and low setting on the remote which allows you to fly more or less aggressively with the touch of a single button. They both also can perform flips, although the X8C struggles a bit if it is fully weighed down with prop guards, landing skids, and a camera. I have found that both of these quads fly best if you strip them down to their essentials by removing the landing skids, camera and prop guards. The first thing I noticed about the X8C when I unboxed it was how light-weight it feels. This is a good thing because it means longer flight times and less safety concerns. But this is also a bad thing because it means that the components used in the electronics and airframe are probably pretty cheap and won’t hold up as long as a more expensive (and heavy) quadcopter. Lighter weight also means that it struggles in the wind a bit. However, if you switch from “beginner” to “advanced” flight mode by pushing the top left button on the remote, you will find that the more aggressive flight angles help you handle the wind much better. Generally, this bird is cheaply built, but that does not necessarily mean it is not well built. In fact, when I took mine apart to replace one of the motors, I realized just how simple and elegant the electronics running this thing are. There are a few things that stand out to me about the build of this quadcopter. First, the propellers are difficult to change out. Most quadcopters either have a threaded nut that goes over the top or the propellers themselves are threaded. Not so with the Syma X8C. The propellers are held on by a tiny cotter pin, which is very difficult to remove and replace, not to mention easy to lose! If I could ask for one design improvement, it would be the way you add and remove the props. The rest of the bird is pretty easy and straightforward. The landing gear pops right into place with no tools required. The camera is also easy to slide on and off. The LED lights are fairly bright. And finally, the prop guards require some tiny screws, but they are not difficult to add or remove. In general, I think this copter is well designed and fits together nicely for the price point. As mentioned before, the only tough part about putting the X8C together is putting on the props. I have ordered two X8Cs and one came with the props already on and one had to have the props put on. Everything else is pretty simple. I suggest putting the battery on the charger right away because it takes a while to fully charge. I also suggest leaving the prop guards off unless you are an absolute beginner. The prop guards not only add weight to the aircraft, they also make it less aerodynamic and more sluggish in the air. The camera slides simply into a slot on the bottom of the craft and is powered and controlled by a 1/8” mini connector that you plug in just like you would plug in headphones. If you are flying with the camera, then you will need to make sure to add the landing skids, which pop into place with no tools. And you will also need to make sure the camera has a micro SD card formatted and ready to go. Luckily, the camera comes with a 2 gigabyte micro SD card, so you won’t have to buy one. This quad is a blast to fly. It is big enough that you can really see it well outdoors and it can handle a light wind really well in “advanced” mode. With the camera, landing gear and prop guards, the brushed motors seem to be a bit strained and take a few moments to respond. But if you take those things off and fly it “stripped down”, these motors really get up and go! On the top of the remote control are 2 buttons. One switches you from “high” (advanced) to “low” (beginner) range. The difference here is how much angle the quad will take in your maneuvers. Low is great for beginners. You will know when you have switched because the controller beeps once when you are in beginner mode and beeps twice when you switch over to advanced mode. As I mentioned earlier, if there is any wind at all, you will want to fly in advanced mode. I find that beginner is great for when I let someone else, who is not experienced, try flying my Syma X8C. One other important note is that this bird has no GPS, so you are always piloting and never really “parked” in the air. This is actually a great way to improve your flying skills. I have found that after flying the Syma X8C, I became much more comfortable with controlling my Phantom and Solo both in and out of GPS mode. One really cool maneuver that I like to do with the X8C is fly it forward full speed in expert mode, which causes the nose of the craft to dip down. Then, when I have some speed going, I pull back on my direction stick, which causes the nose to tip up sharply. I then let go of the direction stick and push the “flip” button at the top of the remote. If you time this correctly, it almost looks like it is doing a “loop” rather than just a simple “flip”. Needless to say, flying the X8C is a blast, with or without the FPV mode that the X8W offers. Syma really got it right with their X8C line. Whether you are a beginner or experienced pilot, you will enjoy flying one of these series of copters. If you are looking for a good way to shoot professional quality video or image, you may be disappointed. However, if you want something inexpensive and fun to fly, you will be very happy.